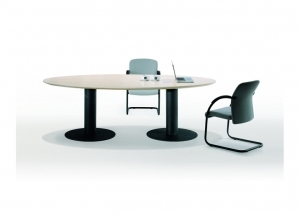 A02 | Meeting Table | Desks | Product | FiC Co. Ltd.
A02 is an ideal conference table to suit contemporary interior. This series feature an elliptical or round top, reverse knife edge and column supports finished in black or silver expoxy-coated powder paint. A round version is also available for limited space.